A fun, sweet treat to end your meal that isn't heavy. Stuff each apricot with an almond. In a microwave, melt candy coating; stir until smooth. 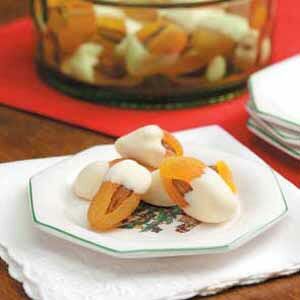 Dip each apricot halfway in coating, allowing excess to drip off. Place on a waxed paper-lined baking sheet; refrigerate for 15 minutes or until set. Store in the refrigerator. Yield: 2 dozen.